Reacting to a staff shortage at the Town and District Bus Company, Inspector Blake comes up with the novel idea of recruiting women drivers. Stan Butler and his conductor, Jack, are, like the rest of the male crews, horrified, not least because there is not a single attractive female among the new arrivals! Determined to be rid of this menace to their overtime earnings, they plot all manner of schemes to get their way. Meanwhile, on the home front, Stan’s ghastly sister, Olive, announces that she is going to have a baby…..
Hammer already knew from their experience in the early years that there were rich pickings to be had from converting popular radio and television programmes into films and the making of this film was prompted by the return to the Company full-time of Michael Carreras. It was based on the London Weekend Television sitcom which had been drawing large audiences since 1969 and turned out to be Hammer’s biggest money-spinner of all time. 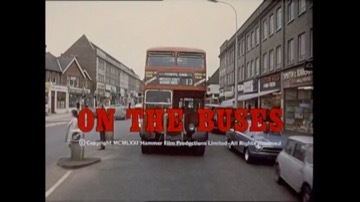 Its success ensured two sequels, “Mutiny on the Buses” (1972) and “Holiday on the Buses” (1973). Roy Skeggs, who later took over the Company after its near collapse in 1979, receives his first credit on film here, although he had been working for Hammer as a production accountant since 1963. Reg Varney was already a well-known face on British television before “On the Buses!’, having appeared in comedy series such as BBC TV’s “The Rag Trade”. Anna Karen appears in several “Carry On” films round this time, although she is virtually unrecognisable without her ‘Olive’ make-up. Further down the cast list, Wendy Richard had been in many episodes of popular TV comedy series, including “Steptoe and Son” and “Dad’s Army”. She later became more famous as Miss Brahms in BBC TV’s “Are You Being Served?” and then as Pauline Fowler in the soap opera “Eastenders”. Moira Foot went on to play Denise Laroque of the Communist Resistance in BBC’s TV comedy “‘Allo ‘Allo” (1988).